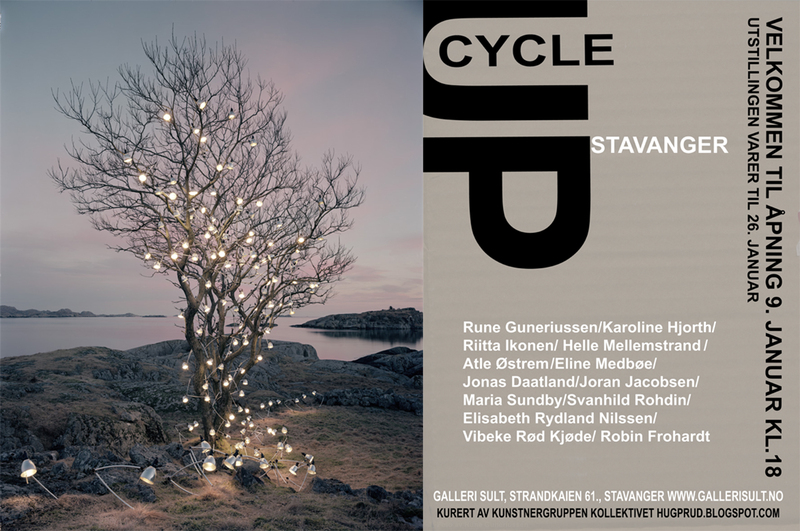 Welcome to the opening reception of the group exhibition Upcycle at Gallery Sult in Stavanger, Norway, January 9th, 6 pm. The exhibition is curated by Kollektivet, a Norwegian artist, activist and curator group. Artists participating are Rune Guneriussen, Karoline Hjorth, Riitta Ikonen, Helle Mellemstrand, Atle Østrem, Eline Medbøe, Jonas Daatland, Joran Jacobsen, Maria Sundby, Svanhild Rohdin, Elisabeth Rydland Nilssen, Vibeke Rød Kjøde og Robin Frohardt. The exhibition is open until 26. January. Upcycling is the process of converting waste materials or useless products into new materials or products of better quality or for better environmental value, in this case ART. Upcycle- the exhibition, sees past the material, and looks into the core of the art, its meaning and purpose. Upcycling investigates the relationship between nature and culture by taking a stance as to the origin of the material and how we as a culture can contribute to a sustainable environment. In a world of commercialism, upcycling on a large scale can challenge what we as a culture find valuable. By upcycling the question is asked; What has value and what is value?